It’s a strange fascination that eastern Europeans have with Depeche Mode. Much like The Cure, there is something about their sensibility which appeals far more on the continent than in their homeland, and indeed for years Depeche Mode have had to deal with negative domestic critical reaction to their output which fails to account for their influence, musical integrity, and sheer longevity. Regardless, Poland has always welcomed them with open arms. This, their first concert in Krakow, took place on February 7th at the Tauron Arena – the electricity company sponsors being entirely appropriate for these electro-rock pioneers, who have been bestriding the world stage for nearly four decades now. Their latest 18 month, 100+ date tour, called Global Spirit, supports their 2017 Spirit album. The crowd: black-clad, 30s/40s average, many die-hards and plenty sporting band merch. The last Depeche Mode album I really looked forward to, as in counting the days down looking forward to, was Violator in 1990, and it’s scary to think that was 28 years ago. Since then Alan Wilder has quit, Dave Gahan narrowly survived a speedball incident and was dead for two minutes. But somehow the band has soldiered on, not only surviving but seemingly getting bigger year on year, despite some fairly ropy albums in the last ten years or so. Innovation has been what has kept Depeche Mode in vogue for so long, and their ability to soak up musical influences over the years and evolve with them has allowed them to stay fresh and relatively relevant. Their choice of support band tonight are Black Line, a Californian industrial rock outfit who have barely made an impact in Europe yet. Their raucous, fairly dissonant sound warms the crowd up (reasonably), and harks back to the days in the late 80’s when seemingly incongruous acts like Nitzer Ebb would regularly open for them. When Depeche Mode appear on stage just before 9pm, the 20,000-capacity crowd has created an atmosphere which is, well, electric, and a roar lifts the roof. The song they enter to, The Beatles’ “Revolution,” foreshadows their own “Where’s the Revolution,” which they’ll play later. First up is “Going Backwards,” also from the latest album, whose fairly bleak take on the turn the way humanity is going despite the amount of technology at hand is an indication of the tone of their new album: “Armed with new technology/Going backwards to a caveman mentality/We feel nothing inside.” Martin Gore’s lyrics thankfully haven’t been dulled yet – indeed events of the last few years have clearly sharpened his poison pen against his targets. You’d be right to expect those to be the likes of Brexit, Trump, and the so-called alt-right, one of whose leading lights, Richard Spencer, came out as an avid Mode fan last year and was immediately rebuffed publicly by the band. While you could argue that Depeche Mode are socialists only of the champagne variety, that rejection was immediate and blunt. A fair chunk of the first part of the set is lifted from 1997 album Ultra – in fact five of their 20 song set was comprised of songs from that album, which in my eyes is no surprise, as it’s one of their strongest albums and one whose songs have neither aged nor become less crowd-pleasing in live performance. “It’s No Good,” “Barrel of a Gun,” and “Useless” are blasted out, with some impressive visuals on a massive screen behind the band: Anton Corbijn’s work, a long-time collaborator of the band. New interpretations of videos for songs are a bit hit and miss, but “Useless”’s grainy black and white film of a disgruntled and disaffected looking couple in a derelict backyard suits the dejected tone of the song. Gahan slinks, shimmies, sashays, and spins around the stage, belying his 57 years. He still has the moves like Jagger, and there are few performers of his age that come to mind besides the Stones front man and perhaps Iggy Pop who have the sheer energy at this stage of life to lift a crowd as effortlessly. Behind the keyboards, Andy Fletcher, looking a bit like an accountant in a turtle-neck who has found himself accidentally in a rock band, does his best to add a bit of stardust, occasionally raising his hands to encourage the crowd, but it’s obvious where the real keyboarding talent is coming from, and it’s on the other side of the stage. Peter Gordeno, a defacto band member since Wilder left, is the keyboard player wearing the trousers here, producing some deft melodies and additionally filling in on bass guitar. The drummer, a doppelganger for Lars Ulrich – Christian Eigner – adds beef and pounds away spiritedly as the crowd starts to fully warm up. His regimented, measured drumming is impressive. A beautiful bit of guitar melody from Gore lifts the crowd and brings a tear to the eye for the moving “Precious,” before the first violation of the night: “World in My Eyes,” which is lapped up joyfully by the crowd while Gahan, slathered in sweat by now, minces around the stage, flirting, gesturing, remonstrating, demanding that we sing along. How could we not? The second half of the set begins after the beautiful new, down-tempo version of “Insight,” sung falsetto by Gore with Gordeno on piano bathed in a deep red backdrop. “In Your Room” has an interesting video of a couple dancing and cavorting in an, erm, room, and then “Where’s the Revolution” is played, further nailing Depeche’s modus operandi to the flag. 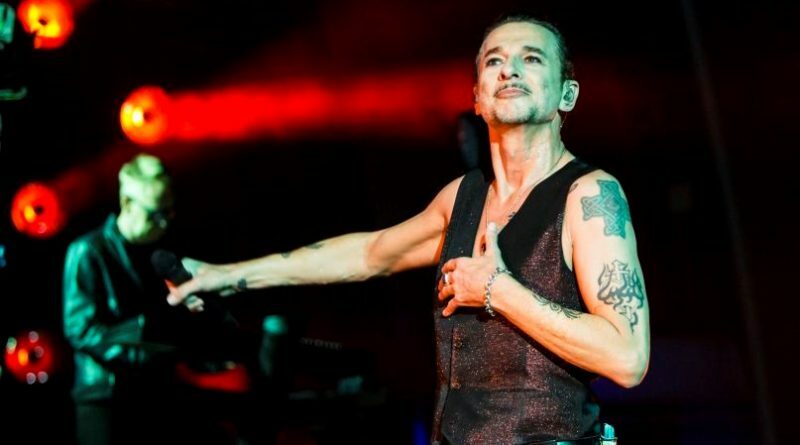 Imploring us, “Come on now people, you’re letting me down/Where’s the revolution?”, Gahan is a modern-day circus-master, with a Lenin badge pinned to his lapel. So do we really believe he, like, cares, man? Maybe not, but politics and pop have rarely good bedfellows made. It’s a rousing anthem nevertheless, and one to add to the canon. Next, a quartet of crowd-pleasers to bring the main set to an end: “Everything Counts,” the 80’s anti-Thatcherite, anti-materialist anthem which retains relevance today, a belting, visceral blast of “Stripped,” then the gorgeous “Enjoy the Silence” – words, unnecessary – and finally “Never Let Me Down Again.” Safe as houses. The band leaves, the crowd chants. An encore inevitably – another moving acoustic version with Gore on vocals – “Strangelove,” reminding us of the strength and strangeness of Music For the Masses, which launched Depeche as a stadium band in the first place. “Walking In My Shoes,” one of only two songs lifted from Songs of Faith and Devotion (“I Feel You” sadly overlooked) is accompanied by a backdrop of a new take on the song as we follow a transvestite singer getting dressed in the morning and wobbling to work on a pair of high heels (nice) and suddenly we’re into “A Question of Time,” ripped through at high velocity and with maximum crowd participation by this stage; fists pumping, the whole place shaking and celebratory. They’ve taken us under their wings with their persuasive ways, but the time is running out for us. By this time, we’re doing exactly what they want us to. There’s only time for “Personal Jesus,” and for us to reach out, and indeed touch faith. A stomping, storming, quasi-religious joy. What more triumphal note is there in the world to finish on? These erstwhile boys from Basildon are now reaching the stage of life where most of us are looking to move down a gear. 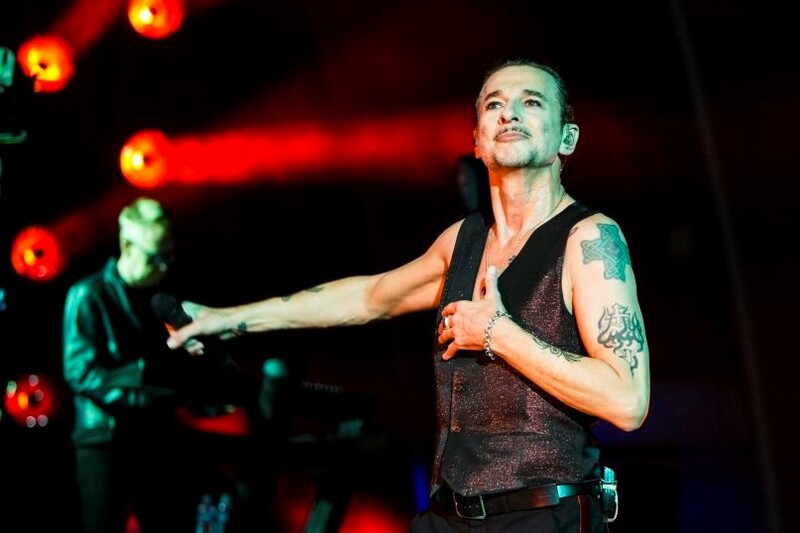 Depeche Mode, the spirited bunch that they are, are raging at the dying of the light.